Eva Stachniak’s THE WINTER PALACE is a fictional account of Catherine the Great’s rise to power, told from the perspective of a low-profile servant in the court. In this interview, conducted by Bookreporter.com’s Melanie Smith, Stachniak discusses her inspiration to write about this legendary figure, her extensive research process, and her opinions concerning some of the laws and customs of 18th-century Europe. She also shares stories about growing up in Poland in the “Regained Territories” after World War II and previews THE EMPIRE OF THE NIGHT, her forthcoming novel that will be told from Catherine’s point of view. 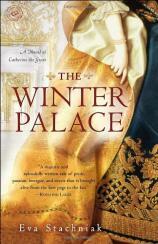 Bookreporter.com: THE WINTER PALACE delivers some untraditional views of the legendary Catherine the Great. What inspired you to write about her? Eva Stachniak: There are so many Catherines. A minor Prussian princess brought to Russia at 14 to wed the Crown Prince, an immigrant who had to reinvent herself. There is a young, vulnerable bride in a marriage doomed from the start. A mother whose children were snatched away before she could take them in her arms. An intelligent, pragmatic and rational ruler who had herself and her son inoculated against smallpox to set an example for her subjects. A passionate and sensuous woman who --- as she grew older --- chose younger and younger men for her favorites. There is also Catherine an avid reader of history and philosophy, a writer of memoirs, plays, books for children, and hundreds of letters. An avid and sophisticated collector of paintings and art. A builder of palaces. A passionate gardener. A great lover of dogs and birds. And then there is Catherine a usurper who took the Russian throne from her husband and brought about his death. An empress hungry for victories, bent on the expansion of Russia, ruthless to her enemies. A formidable player on the European scene who did not allow anyone to push her around. How could I resist her? BRC: What made you decide to write about the making of a luminary from the perspective of a court spy? ES: I knew from the start that I’ll write two novels about Catherine. She was too big, her life too dramatic for just one. I also knew that the second novel would be written from her point of view, but before I could do that, I had to study her from outside. The idea of a court spy came from the 18th-century complaints of many travelers to Russia that all servants were spies who traded in secrets and from Catherine herself. Reading Catherine’s letters to Sir Charles Hanbury-Williams, I came upon the following sentence: Three people who never leave her room, and who do not know about one another, inform me of what is going on, and will not fail to acquaint me when the crucial moment arrives. Three spies in Elizabeth Petrovna’s bedroom? Not knowing about one another? The sentence stuck in my mind, tempting with possibilities. Who were they? What was their relationship with Catherine? I decided that they came from among the women who were attending Elizabeth during her illness. I assumed that --- like many courtiers who had watched Catherine for years --- they wished Catherine to be the next empress. Once the seed like this is planted, the creative mind takes over. In the end, I simply heard Varvara’s voice. I didn’t expect, at first, that she will be the sole narrator of THE WINTER PALACE. But her voice turned out to be so strong, so engaging, that I knew I had to let her speak. BRC: How did you research THE WINTER PALACE? ES: I started from reading: diaries, memoirs, letters, and many excellent biographies of my principal characters. I read books on 18th-century gardens, interiors, jewels, clothes. I paid particular attention to voices of women from that time. I noted their concerns and fears, aspirations and dreams. Then I travelled to St. Petersburg to orient myself in the physical space of the city. I visited the palaces where Catherine lived --- knowing all along that they have changed tremendously over the years. I went to museums to look at objects she had or could have had. I looked at her portraits and sculptures of her. And then I walked through the streets of St. Petersburg, taking copious notes on everything I saw, the flow of the river, the position and intensity of the sun, the plants, the changing hues of the sky during the white nights. BRC: Which key plot points in THE WINTER PALACE are fiction versus fact? Did you set any rules for yourself about how you would handle creating your fictitious story? ES: All major events from the court life are based on the existing historical sources, the marriages, births, deaths, political plots. However, since Varvara --- my narrator --- is a fictional character, I allow her to witness and learn of events that are merely plausible. There are some scholars who suggest that Peter, Catherine’s immature husband, was not always such a foolish and annoying character as Catherine wished him remembered. Catherine’s son Paul, for instance, after his mother’s death was determined to honor Peter with a proper funeral. I wondered if this was only because Paul cherished the thought of humiliating his mother (which he did) or maybe also because from his troubled and sad childhood he preserved some good memories of the man he believed was his father. Many contemporaries recorded in their diaries that, although Peter was foolish and often crude, he also had a good heart. This is why I allowed Varvara to witness a fictional scene between Peter and Paul in which the two are playful and affectionate. BRC: Was there any proof in Catherine’s letters and memoirs that she ever loved her paramours? ES: There is enough evidence in her writing and testimonies of others to suggest that she loved most of them at some time, though not always, and not for very long. She loved Stanislaw Poniatowski with all her heart when they were together. Catherine’s letters to Sir Charles Hanbury-Williams begging him to find a way for Poniatowski to return to St. Petersburg provide moving evidence. Many visitors to Russia recall Catherine speaking lovingly of Grigory Orlov, her partner of 12 years, and note that their relationship ended mostly because of his infidelities. Grigory Potemkin was, possibly, Catherine’s greatest love, although their passionate and uneasy relationship went through several stages, and in the end they had what could probably be best described as an open marriage. Until the end of Potemkin’s life, their letters are filled with countless examples of true tenderness, but I’d like to reserve this part of Catherine’s life for my second novel. BRC: Do you feel there is truth to the notion that every nation carries its own weakness: “French sloth, Prussian greed, Russian pride”? ES: In the 18th century, nationalism was still an emerging concept. To forge a more uniform identity from a multitude of ethnic, tribal and religious affiliations, nations needed new ways of defining themselves. One way was to see one’s country as fundamentally different from its neighbors, and take pride in these differences. This translated to: We do things the right way, they do not. We are virtuous, they are sinners. BRC: Please give us some background on Peter the Great and his “monsters.” Can you tell us how ordinary Russians viewed his interest in activities most people today would call insensitive, grotesque, or even criminal? ES: Peter the Great, the father of modern Russia, was the founder of Kunstkamera --- Russia’s first natural history museum --- which housed his collection of “monsters,” deformed fetuses of animals and humans. As a reformer, Peter the Great wished to take his country into the modern era, in spite of any objections his subjects might have. For instance, he forced aristocratic Russian women to leave their sequestered quarters and appear beside their husbands at court functions and made his boyars shave their beards. But he also wished for wider reaching transformations. One of his goals was to curtail the reign of superstition and beliefs in witchcraft that assumed, among other things, that the Devil could interfere in human development and sire monsters with his human or animal lovers. Peter the Great wished his subjects to approach puzzling phenomena not as dreadful supernatural forces, but with an open and critical mind. The inspiration for Kunstkamera came from Peter’s grand tour of Western Europe, where he saw many collections of curiosities. If other countries had their human and animal “monsters,” he reasoned, Russia must have them too, and so he ordered his administrators to start collecting them. To encourage his subjects not to dispose of the “monsters” in secret, the tsar designed an elaborate system of incentives and punishments. He paid more for a live “monster” than for a dead one. Anyone concealing a “monster” faced steep fines; anyone informing on someone concealing one was rewarded. Soon Kuntskamera housed hermaphrodites, dwarfs, joined twins and displayed a multitude of jars with deformed specimens. The displays were accompanied by inscriptions that informed the viewers that these deformities were not the Devil’s work: they were caused by illnesses, mistreatment of the mothers, or by their thoughts and fears. We find the idea disturbing, but it’s worth remembering that human sensibilities changed dramatically over time. Eighteenth-century Europeans considered a lunatic asylum to be a source of excellent entertainment; they paid to see freak shows or crowded to see public executions. How did people react to the first museum? Some with deep fear and disgust. Some with approval and curiosity. But Peter the Great left little to chance. He did what he thought would encourage frequent visits. Under his rule, the museum was free and every visitor could count on a complementary shot of vodka to steady his or her nerves. BRC: To what degree were the many barbaric actions of Empress Elizabeth Petrovna historically documented? Did her people ever see through the farce of her public decision not to execute anyone? ES: In the context of the 18th century, Elizabeth was not crueler than other European rulers. She took her vow not to kill anyone at the spur of the moment, bargaining with God for her own future before her coup, and tried to keep her promise. Since her advisors found such sentiments impossible to honor, they found ways --- with Elizabeth’s tacit agreement --- to get rid of political opponents by other means. Exile, imprisonment and public beatings that frequently led to death replaced the death penalty. Was this hypocrisy noted? Yes. Commented upon? Yes. But in the end, Elizabeth Petrovna was not considered worse than her contemporaries, and much better than some of her predecessors. Empress Elizabeth, who emerges from the historical accounts, memoirs, letters and studies, is a complex character --- rash and passionate, but also crafty and far-sighted in her dealings. She loved pageantry. She loved life, dancing, singing and gossiping, but she also loved Russia and was deeply religious. It is important to remember that --- with all her faults --- she managed to entrust Russia’s business to capable politicians. Bestuzhev was one of them, but not the only one. Elizabeth Petrovna was a beloved empress in spite of her faults. At the end of her rule, Russia was a greater and more prosperous country, and her subjects knew this well when they mourned her passing in outbursts of public grief. BRC: In the storytelling, time and time again, you dip into interesting era details and superstitions, ranging from the archaic use of elixirs and roots to many odd superstitions about pregnancy, good and evil, and the fickleness of fate. Did you discover these through research, and have any survived in today's world? ES: I love searching for details that render the texture of everyday life. It is through them that I can best imagine my characters. Luckily, there are many sources that provide such information. Doctors and midwives wrote handbooks and diaries. Old newspapers advertised remedies for various ailments, travelers were diligently describing differences in customs, cures and beliefs. How many of these superstitions and beliefs are still with us? My maternal grandmother’s life was ruled by many of them. She taught me to count the number of cuckoo calls to answer questions like: How many years of life do I still have? How long before I’ll get married? She would warn me not to stare into mirrors, she would brew herb infusions for coughs and indigestion. My early childhood was filled with advice and prohibitions she recalled from the teachings of her mother and aunts. And even though many of these old beliefs do not survive closer scrutiny, some have proved to have merits. In my local health food store, I can still buy infusions my grandmother used to make. St. John’s wort is still good to chase away the blues, peppermint tea still settles an upset stomach, and hawthorn berries are still good for the heart. BRC: The details on the death of Elizabeth Petrovna are surprisingly gory, particularly for a death from natural causes. Do you know what killed Elizabeth and whether her last moments were recorded or witnessed by Catherine? ES: Elizabeth suffered from a chronic heart condition that got progressively worse and turned into heart failure that slowly suffocated her. It didn’t help that she drank quite heavily and loved heavy foods. The 18th-century medicine with its purgings and constant bleedings did not help either. Unlike Princess Dashkov at that time, we know why Catherine had to postpone her coup: she was five months pregnant with Grigory Orlov’s child. BRC: Your birthplace is listed as Wroclaw, Poland and your current home as Canada. Can you tell us about your homeland, the languages you speak, and areas of the world where you’ve lived and traveled? ES: I was born in Poland. My city, Wrocław, is a particularly interesting place because it is part of the so-called Regained Territories, the sliver of Germany Stalin “gave” Poland after WWII, as a sort of recompense for the territories in the East that were annexed by the Soviet Russia. In 1945, the Regained Territories were a magnet for refugees with no other place to go. It was also an area that had been heavily bombed (Wrocław lost 80% of its buildings) and from which German refugees left in a hurry, leaving many of their possessions behind them. As a result, I grew up next to burnt-out streets and heaps of ruins, in a so-called post-German house where nothing was or felt like “ours.” My grandparents and, to a lesser extent, my parents mourned the lost Poland, their “own” houses from which they were evicted as a result of the political upheaval that came with the victorious Red Army. The German past of the Regained Territories was hardly ever mentioned. For me, as I was growing up, it felt that I lived in a no-man’s land, that real Poland is elsewhere and that everyone around me is a refugee from some other, mysterious and lost life. It was perhaps because of this that I did not feel a deeper connection to Wroclaw when I was growing up, though as soon as I left, I realized what a fascinating city it was. But there were other reasons, of course. My parents were politically opposed to the communist regime; my mother was a political prisoner at 16. I was brought up in the atmosphere of internal emigration. Do everything to preserve your independence of the current regime, claim your right place in the real world not in this “prison camp,” as Poland was often called then. The result of such thinking was that when I was six years old, my mother hired a private tutor to teach me English. Later, she found an even better teacher, a British wife of a Polish pilot who lived in Wrocław. Mrs. David was not a trained teacher, but she loved to talk and wanted to learn as much about me as she could. She told me stories of her growing up, her marriage to a dashing Polish pilot, her bewildering arrival in the communist Poland, and then demanded I tell her about myself. To a growing girl, this proved an irresistible exchange. Since English was always part of my childhood, after high school I enrolled in the English Department at Wrocław University. Then, when Poland went through a political thaw and travel became possible, I went to England for a year. I worked as an au-pair, a waitress, a secretary and went to school to improve my English. During this year in London, living entirely in English, I began thinking and dreaming in English, a sign of comfort with the language that did not leave me even after I returned to Wrocław. Like Joseph Conrad before me, I like to say that English adopted me then and there. I left Poland for good in 1981, three months before the Solidarity crisis, as a recipient of a graduate scholarship to McGill University in Montreal. These were hard moments for me. My husband and my three-year-old son were still in Wroclaw, their passports and tickets suddenly rendered worthless by the martial law. It took a year for them to get permission to join me. As soon as they arrived, we applied for permanent residence status. We have lived in Canada ever since. BRC: Has your Polish heritage granted you unique perspectives on Russian and Polish history? ES: Russia has always been a looming presence in Poland. It was Catherine the Great who presided over the partitions that left my country divided between Russia, Prussia and Austria. My family, both on my father’s and mother’s side, lived under the Russian partition. This meant that my grandparents went to Russian schools, that my paternal grandfather spent years serving in the Tsarist army. Then, of course, after WWII, communist Poland was a satellite Russian state, and in addition to learning Russian at school, we were forced to participate in the declaration of the forced manifestations of friendship between the Soviet Russia and Poland, which did little to diminish the feeling of subjugation. Russia’s presence --- even after Stalin’s death --- was menacing, towering and never possible to ignore. In Poland, Catherine the Great was and, to a certain extent, still is, quite understandably, a controversial figure. She was blamed for installing her cast-off lover on the Polish throne and for crude meddling in Polish affairs. She crushed Poland’s last uprising, imprisoned Thaddeus Kosciuszko and other Polish freedom fighters in St. Petersburg, and wiped Poland off the map of Europe. These inherited national memories make it necessary for me to look at Catherine the Great from two conflicting cultural perspectives, but they also warn me against national prejudice. They force me to re-examine everything I was ever taught about Russia, and to find my own perspective. BRC: I’ve heard you’re planning a second volume on Catherine, presumably the same tale told in THE WINTER PALACE but written from Catherine’s perspective. What an interesting concept to complement a remarkable historical! Can we expect many different themes in the second book, and will it cover an extended timeline or include the greater contributions of Catherine that purportedly led to Russia’s Golden Age? ES: THE EMPIRE OF THE NIGHT, for this is the title of the second Catherine novel, will be told from Catherine’s point of view and will cover her whole life, with emphasis on the 34 years of her rule, her contributions to Russia’s glory and her conquests of Russia’s neighbours. If THE WINTER PALACE is the story of Catherine’s fight for power and her own survival, THE EMPIRE OF THE NIGHT examines the consequences of her spectacular victories. Together, I hope, the two novels will complement each other, giving a fuller picture of this remarkable empress and a fascinating woman.